Walt’s Nine Old Men were a core group of supervising animators who created Walt Disney Studios’ most famous work – such as Snow White and the Seven Dwarfs and The Rescuers. Walt jokingly called them his “Nine Old Men” (even though most of them were in their 20s when they first started at the studio) – referring to U.S. President Franklin D. Roosevelt’s nine Supreme Court judges. All nine of these talented gentlemen were named Disney Legends in 1989. Hello everyone, and welcome to this week’s #TiggerificTuesdayTrivia post! I’m joined as always by my dear friends Jodi from Magical Mouse Schoolhouse and Heidi from Heidi’s Head. This month we are sharing some great trivia revolving around Walt’s Nine Old Men. Today we are sharing some trivia about Eric Larson. Almost more important than the works he is credited with, check out the list of some of those animators that went through his training program! 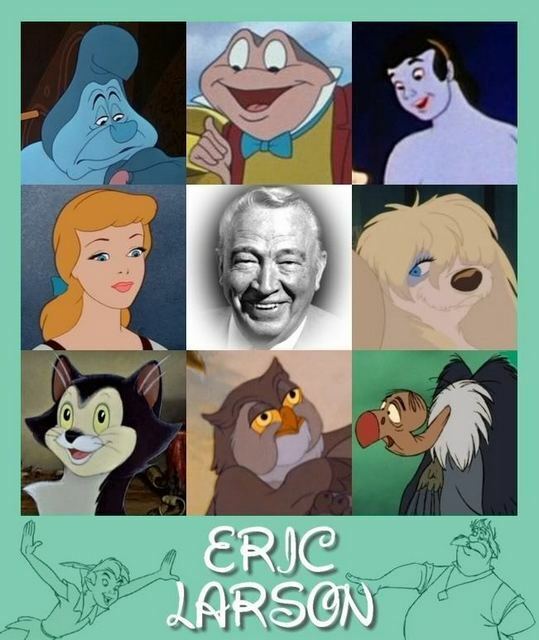 Eric Larson from Utah (born 9/3/05) began work at the Disney Studios on June 1, 1933. Larson started as an assistant animator on the shorts The Tortoise and the Hare and Two-Gun Mickey. By 1940, he was an animation director and had designed Figaro the cat for Pinocchio. He also animated the horses and centaurs for the “Pastoral Symphony” sequence in Fantasia. Larson assisted Marc Davis in creating the title character of the 1950 Cinderella and animated Caterpillar for the 1951 Alice in Wonderland. But his most famous sequence, is the flight to Neverland in the 1953 Peter Pan. After Walt’s death in 1966, Larson was placed in charge of finding and training new talent (along with animator Walt Stanchfield) – in addition to his character animating work (which ended as a consultant for the 1986 The Great Mouse Detective). Many well-known animators went through Larson’s training program, including Brad Bird, Don Bluth, Tim Burton, Ron Clements, Andreas Deja, Glen Keane, and John Lasseter. Larson retired in February 1986 after 52 years with Disney – making him the last of the 9 to retire. He passed away just two years later. Thank you for stopping by today! Now, please go check out the other entries in our post this week, and have a great day!